If you service Macs on a regular basis, sooner or later, you’ll absolutely need an older Mac OS X installation disc to complete a project that’s due in a very short amount of time. Under normal circumstances, I’m sure you’d be happy to buy it off Craigslist, eBay or any other source, but the deadline is approaching and you’ve run out of options. You can find old OS X installation software on BitTorrent. At this time, you might consider entering the murky legal and ethical waters of BitTorrent. People who are sharing OS X installation software are unauthorized to do so, and you're downloading copyrighted material, so you're violating a number of piracy laws. There’s also a security issue: BitTorrent downloads are sometimes infected with malicious code. Proceed at your own risk. So if you’re in dire straits, you’ll need a BitTorrent client. You can get the official BitTorrent client or you can use an app like Transmission, which runs smoothly and offers a wide set of features with which to control the download and sharing speeds from your end. Once the BitTorrent client has been installed, it’s easy to go to a torrent site, though it’s easy enough to Google a search term such as “Mac OS X 10.5 install DVD torrent” and be taken to a variety of similar Web sites. After finding the torrent file you’re looking for, click the download link, allow your BitTorrent application of choice to kick in and the download will begin. Like most peer to peer sharing systems, your download speed will increase dramatically if more users are sharing the file, so try to look for files that are being shared by a larger number of users as opposed to just a few. Once your download is complete, mount the Mac OS X disc image via Apple’s Disk Utility program by choosing New > Disc Image from File (or Disc Image from Folder, whichever is appropriate to the situation), choose to save the file, confirm the decision with your Mac OS X system password, and let Disk Utility create the image from the downloaded file(s). 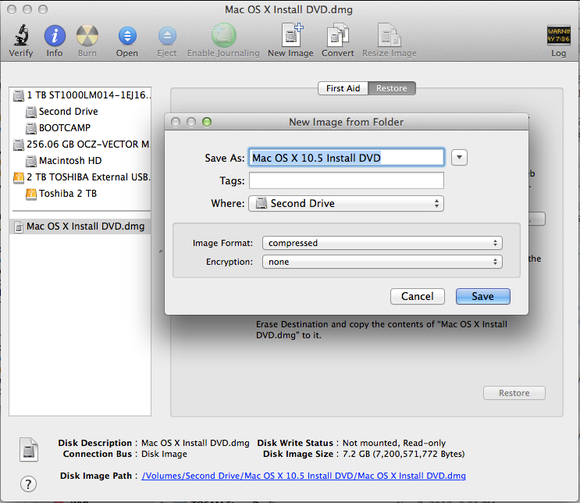 Let the image creation process finish, click Burn, be sure to insert a blank CD or DVD, then sit back and let Disk Utility create the installation disc. Use Disk Utility to create an image. Using BitTorrent isn’t the most ethical and legal way to go about acquiring a long lost Mac OS X installation disc file and recreating it. But Apple only makes its Mac OS X installation discs for so long and only so many are sold on the open market.